If The Wire and Breaking Bad are any indication, the ideal length for a television series is five seasons. The Wire was ambitious and unanimously praised for among other things bringing a complex, nuanced tale to our screens with a remarkable level of execution. It was like watching a really good novel manifest in our living rooms one chapter at a time. And Breaking Bad is, in this writer’s opinion, not only better than The Wire but it’s the only television series to completely avoid a lull in quality during its run, a truly remarkable feat. As arguably the two greatest TV shows to ever grace the small screen, these series set the standard for what’s possible in serialized narrative storytelling via cable television. But the most important truth The Wire and Breaking Bad understood is that too much of a great thing is still too much. On the other hand, while AMC’s The Walking Dead has been a monster hit in every sense of the phrase, it’s just wrapped its eighth season and in doing so it’s clearly become a show that needs to find a place to end, lest it die, rot, and shamble forth just like its titular menace. 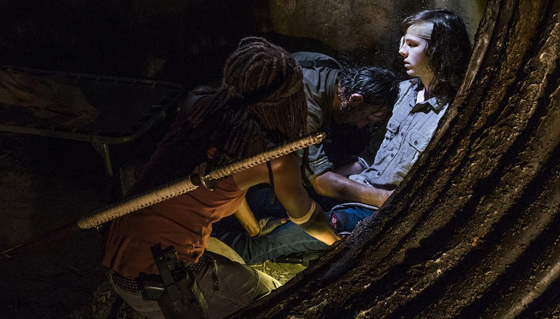 When we last saw our heroes at the midseason finale, it was revealed that Carl (Chandler Riggs) had been bitten by a walker and was going to die. The midseason premiere takes us right back to this and proceeds to drown us in the miasmic melancholy of Carl’s death for a depressing and unnecessarily long two-hour episode. 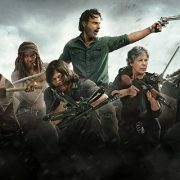 What it reveals, though, is the extent to which Carl wants his father Rick (Andrew Lincoln) and their nemesis Negan (Jeffrey Dean Morgan), leader of the ironically named Saviors, to let bygones be bygones (if by “bygones” you mean death and despair) and start over, working together to build a better future. Alexandria and the Sanctuary have both been badly damaged in opposing sieges which has forced our group to occupy Hilltop where Maggie (Lauren Cohan) now leads. 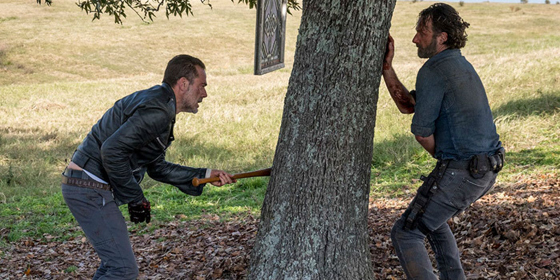 In the midst of a plan to taint their weapons with walker guts and infect our heroes, Negan gets ambushed by Rick and is assumed dead by many of his Saviors, including Simon (Steven Ogg) who seems overzealous to fill the apparent leadership void. Here we learn that Simon is a true monster, having defied Negan’s earlier orders to kill one of the Scavengers to send a message to their leader Jadis (Pollyanna McIntosh) and instead wiping out her entire community. Turns out, it was Simon – not Negan – who was responsible for slaughtering all the men and boys at Oceanside too. Nice guy! As Rick pursues Negan one-on-one, Negan eventually escapes but gets kidnapped by Jadis who’s looking to avenge her people. The others continue to argue with themselves and each other about what the right thing to do is and, of course, Negan eventually escapes from the Junkyard. This season’s best element – by a lot – is the character of Dwight (Austin Amelio), a former lieutenant of Negan’s who’s now working for Rick as a double agent. This is the one character who’s been given a compelling, dynamic arc and Amelio’s performance conveys every bit of it. It should come as no surprise, then, that Dwight ends up as the lynchpin for this season’s coup de gras as things come to a head when Negan returns to the Sanctuary, murders Simon and sets up Dwight and thus Rick and our heroes in a trap. In other words, our heroes merely do what they’ve been talking about doing for two seasons now in what amounts to an anticlimactic, contrived episode full of double-crosses, triple-crosses – hell, even quadruple crosses. When the smoke clears, this finale is far more notable for its revelation of next season’s conflict than it is for anything it depicts involving the Saviors story line we’ve been watching for the past couple years. 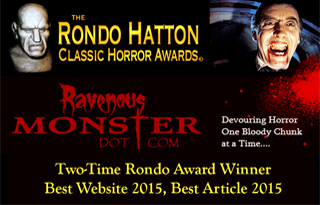 Even so, in relative terms it’s an episode that feels gratifying because some plot progress has finally been made. It feels long overdue. Much like the past few seasons, not much of consequence happens between the premiere and the finale. There are some entertaining episodes to be sure, but where The Walking Dead used to somehow infuse high zombie action with emotionally moving subplots, everything now feels entirely in service of the plot. Characters have stopped developing altogether, a common pitfall among stories that stick around a little too long. As such, there are several instances when the timeline feels muddled and when characters act in ways that are only justified by whether it’s a means to an end, plot-wise. For example, Negan’s affinity for the late, great Carl Grimes is completely undeveloped, unmotivated, and inexplicable save for the fact that on a few occasions over these past eight episodes it’s served as a temporary reason for Negan to act or not act in ways required by the plot. This problem is as old as storytelling itself, and yet here it seems avoidable if not for lazy, formulaic writing. Not just this season, but the future of The Walking Dead has been imperiled by a self-inflicted wound committed by showrunner Scott Gimple and his staff in the writers’ room — namely, the decision to deviate from the source material and kill Carl. The fuel that propels this entire enterprise forward has been the dynamic between Rick Grimes the father and Rick Grimes the survivor. The opposing trajectories of those two roles imbued the series with a palpable, everyman kind of tension that anchored us into a situation that’s ostensibly so bizarre and terrifying that it’s otherwise tough for us to relate. Baby Judith’s negligible presence aside, removing Carl from the show obliterates this crucial push-pull. The Walking Dead is far from being alone in this plight. For example, Showtime’s serial killer series Dexter suffered a similar fate. The fuel for that series was the byproduct of a struggle between Dexter the family man and Dexter the serial killer. This series gave us four exceptional seasons, but after the Trinity Killer murdered Dexter’s wife Rita at the end of the fourth season – thereby eliminating Dexter the family man from the equation – the show continued for an additional four relatively rudderless seasons. The difference in quality caused by this one decision was stunning. It went from can’t-miss to barely watchable. The Walking Dead is blessed with having been based on quality source material. The comic book series provided the TV show with readymade, well-conceived characters occupying a fully-realized zombie-plagued world that had already proven itself to be a successful narrative recipe for several years before finding life on television. In fact, most of the show’s major deviations from the comics have proven problematic. Yet, because the comic book series continues, it can’t provide the show with a proven pathway toward an ending. And THAT is what The Walking Dead needs now more than anything else. 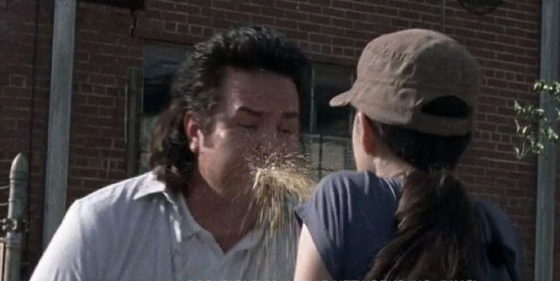 As far as The Walking Dead season eight goes, perhaps we’ll look back years from now and remember when this season replaced the phrase, “Jumping the shark” in our pop-cultural lexicon with, “Barfing the nerd.” Thanks Eugene.